What to do when you’re overworked, overwhelmed and over-everything. On Saturday afternoon my husband and I climbed into our hot tub for a little soak. Steven had just come home from a 35-mile bike ride; I had just finished writing my blog. Now, I know what you’re thinking: maybe we had a little romance, or just a sweet dash of downtime. I wanted to talk about my blog. Steven wanted to celebrate his glorious bike ride. He said, “Is there no sacred space for our relationship? Do we always have to talk about work? What about us?” Okay, good questions. Clearly, one of us was better at turning off work than the other (at least on the weekends). So instead of enjoying each other, we started to bicker and blame. Then we shifted, and stayed inside that hot tub committed to our relationship and finding an answer to stop the insanity. We were burnt out not just on work, but talking about our business ad nauseam for 12 straight years since we had decided to join forces. There, bathed in New Mexico sunshine and surrounded by juniper and Aspen tree covered mountains, we came to realize that my weekend blog writing and Steven’s massive weekday to-do list left no room for our marriage. After I poured my heart out, Steven suggested that he’d make dinner on Monday nights while I write my blog. That way, we’d get to unplug, spend time together and fully engage with one another over the weekend. I said, “Really? You would do that for me? He said, “No, for us.” Identifying the exact problem and coming up with a simple, but workable solution proved to be a major breakthrough for Steven and me. The only way to stop spinning out of control is to do things differently. It’s Monday night at 7pm and Steven is preparing halibut baked in parchment paper, Simon and Garfunkel’s concert in Central Park is playing in the background, and I’m sipping wine and writing to you. Do I feel guilty because I’m not cooking with Steven? Just a bit. But, I’ll get over it! 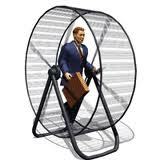 In the work I do, I rarely meet a hard-driving business owner or executive who doesn’t fantasize about getting off the hamster wheel. The exit strategy usually centers around having enough money socked away or getting the recognition they deserve. Just how much money or recognition is usually undefined and therefore, unattainable. Steven and I have always been quite ambitious, but lately we’ve been asking ourselves how much is enough. Our drive is good for each other and toxic at the same time, especially when our fears surface and we fall into our defense mechanisms. It looks like this: he rattles off everything on his to-do list and I tell him how I feel like the weight of the world is on my shoulders. Sound familiar? I’ll be it does. And here’s what I’ve noticed: without openhearted compromise and fresh ideas, we will keep going round and round and never move forward. Tonight my husband is rattling around in the kitchen as I press the keys on my MacBook Pro. Tomorrow we’ll interview three candidates to take over Steven’s to-do list and become his full time assistant. Our fantasy is that next time we get into our hot tub — we’ll do more than compromise and capitulate – we will use the time and space to simply be with each other and NOT talk about work. How will you leave your overwhelmed, overworked self behind to have a real loving relationship with your partner?